The remote village of Yonderdell has harbored dozens of adventuring parties over the years, each passing through on their way the nearby entrance to the Underdelve—the endless complex of lightless subterranean passages. Now Yonderdell is plagued by a ruthless nocturnal stalker. Several of the townspeople have disappeared; one was found horribly murdered. Locals suspect a creature from the Underdelve, but the guards posted at the entrance have seen no sign of creatures from the night below emerging onto the surface. This simple village needs brave heroes to unravel the clues and stop the terror before more lives are lost. "The Underdelve Menace" is an investigative adventure for the Pathfinder Roleplaying Game that can be set in any remote forested hills. Presented for PCs of 7th or 8th level, this adventure also includes notes and statistics for scaling challenges to PCs of higher or lower level. The adventure contains several player handouts and a file containing 1 inch scale color maps of the encounter areas ready for printing. 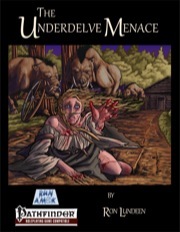 "The Underdelve Menace" is written by Ron Lundeen and illustrated by Blake Wilkie, with maps by Hugo Solis and Joshua Bennett. This adventure by Ron Lundeen is 57 pages long, 1 page front cover, 1 page editorial and 1 page SRD, leaving a whopping 54 pages of content for the second adventure published by Run Amok Games, once again written by Ron Lundeen, so let's check out whether it can hold up to his stellar work so far! This being an adventure-review, and for an investigation to boot, I strongly urge and advise any players to jump to the conclusion. SPOILERS abound and you don't want to spoil this one, believe me! Still here? Are you sure? All right! The town of Yonderdell is a boomtown of sorts, but one of a kind that is seldom depicted in our games, though it is only logical they exist: Yonderdell is located near a relatively safe passage into the underdark and adventurers laden with coins tend to go down there...and sometimes even come back! The small town has profited from this influx of coin and thus been established as a nice place to live, especially with the distinct lack of deadly creatures crawling up from the realms below to kill hapless people. In fact, adventurers killing everything off while descending into the depths and sentinels have kept the town safe and quiet. Until now. Yonderdell has been plagued by a string of missing persons, some of which have been found horribly mutilated. At behalf of the town's ealdorman, the PCs are to investigate the disappearances and make them stop. While still being subjected to the job-interview, they are interrupted by one of the missing persons being found - a halfling barber is fished out the well and promptly turns spectral undead on the onlookers. After the PCs have dispatched this first foe and potentially questioned people and the corpse, they're off to further locales. Wait, questioned the corpse? Yes. The Underdelve Mencae is a scenario that does not leave the GM alone with the tools at the PC's disposal. Detect-spells? Covered. Speak with the Dead? Covered. Special tracking? Covered. We see such considerations all too scarcely in modules and especially in investigations, covering these basics is essential and helps immensely when running the scenario. Even better, in contrast to most published investigations, the "Underdelve Menace" is probably one of the most non-linear ones - essentially, there is more than one way to success and even a plethora of different possibilities for the showdown. Better yet: How the group has acted towards a key-NPC may actually determine the very nature of the final showdown. From an eccentric gnomish gunslinger and his dire badger pet to the gruff, stern female captain of the sentries, the PCs will have an interesting challenge at hand when dealing with the inhabitants of Yonderdell. Even better, if your players are like mine, they are too clever and usually quickly deduce the nature of the perpetrator, necessitating complications or the weaving of a second adventure plot into the main narrative. This adventure does something similar - actually, two independent groups are responsible for the missing persons and a mastermind is manipulating one of them. In order to truly consider the adventure a success, your players will have to put together the clues, make the right deductions and then best the forces of their opposition. The adventure does all that while avoiding linearity. It should also be noted that especially rangers and characters with tracking skills will LOVE this particular module, as there's ample to be done. Oh, and the combat is nothing to sneer at either. And that's about all I will divulge of the story. Because some players might read this. And because I really, really want you to buy this. Editing and formatting are almost top-notch - one of the bookmarks (Act 3) is situated above what should be the first - it's working, though, and the only glitch I could find. no typo, no other errors. Layout adheres to a two-column standard and the pdf, as mentioned, is bookmarked. The original b/w-interior art by Blake Wilkie is awesome For the DM's convenience a timetable of the events is included and information on scaling the adventure (including the more complex statblocks) is given. It should also be noted that, while a gunslinger is featured in the module, an alternate version for firearm-less campaigns is provided. 3 pages containing a total of 4 handouts, including a player-friendly, key-less map of Yonderdell (YES!) are part of the deal as well. And then there's the full color map pack - 26 pages. Yonderdell's map in full color and EVERY combat-encounter area of the module, blown up for use with miniatures, in gorgeous full color, with instructions on how to assemble them battlemat-style - cartography by Hugo "Butterfrog" Solis and Joshua Bennett, btw. If you don't know Hugo's detailed, beautiful work - the closest analogue I can think of is Jonathan Roberts. His maps are that nice. The massive map-pack alone could probably be sold for 5 bucks, but here it's part of the deal and just another reason why this non-linear adventure with its subtle, twisted, by now almost trademark Lundeen-humor in some locations (you'll know when you read it)is a stellar buy. Now available - and with print and print/PDF bundle preorders too! 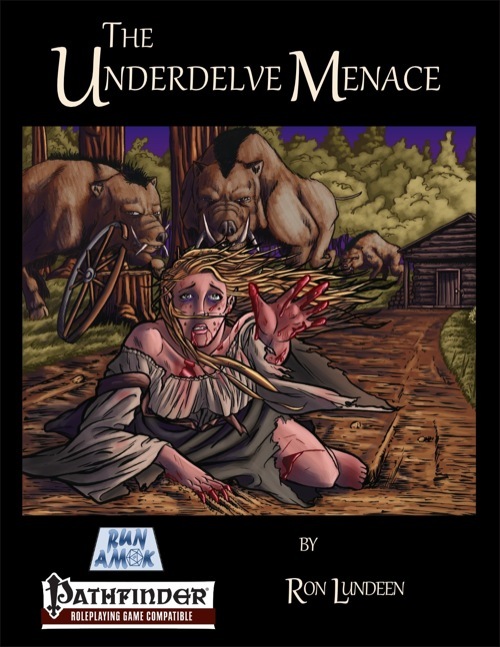 Come check out the second Run Amok adventure, "The Underdelve Menace," a 56-page rural investigative adventure for 7th or 8th level PCs. The adventure contains a mix of roleplaying, investigation, and combat encounters. Like our first adventure, "The Six Griffons Haunt", this adventure comes with a file containing the maps you need, ready to be printed (in full color) and dropped on the table at 1 inch scale. Unlike "Six Griffons Haunt," in which all the action takes place within a haunted manor house, "The Underdelve Menace" map file contains five separate encounter areas--so you get many more maps from the very talented Hugo Solis. How easy would this be to adapt to lower level PCs - say 3rd-level? Fairly easy, I'd say. The adventure includes all the necessary revisions for running this for 5th or 6th level PCs. For 3rd level, you'd do more of the same types of suggested revisions yourself. For example, a 10th level NPC in the adventure is in the "Scaling This Adventure" appendix with stats and tactics at 8th level if you're running the adventure at lower levels (and at 13th level if you're running the adventure at higher levels, incidentally). You'd have to put the NPC together at an even lower level--such as at 6th level--by yourself. But certainly possible. * This adventure doesn't presume the PCs have access to any specific magic or effects--for example, the adventure doesn't require flight or invisibility, even though these abilities are readily accessible to PCs of 7th or 8th level (and make certain encounters easier). One specific case in point: the adventure has sidebars for what corpses "know" if questioned via speak with dead, which low-level PCs won't have. That information isn't critical to the PCs' investigation, but can be useful. * There is a combat with an incorporeal undead, which could be problematic for very low-level PCs that can't affect it. And reviewed here, on DTRPG and sent to GMS magazine. AWESOME WORK! Cheers! I have a question on your review. Are the 26 pages of maps in the 57 page count total, or in addition to? Thanks very much for the review, End! In addition to. The 26 pages of maps are a separate file from the 57-page adventure. I'm not holding myself to any particular page count for adventures-- my adventures are generally designed to fill 6 to 10 hours of play (give or take), and however many pages it takes to tell that story is how long the adventure ends up. That said, this adventure is on the long side, and future adventures will probably be roughly the same size as "The Six Griffons Haunt" (about 35 or so pages). To give a glimpse of future projects in the pipeline, "Teeth of the Storm" (for 1st level PCs) will likely be on the shorter side, and "Kingdom of Toads" (for 17th-18th level PCs) will likely be on the longer side, if only because stat blocks and tactics for ultra-high-level adventures eat a lot of page count. Print copies just arrived at our warehouse! As mentioned upthread, the map file that comes with the .pdf contains the great work by Hugo Solis and Joshua Bennett. If you're inclined to pick up the print version that's now available, I recommend the "print/pdf bundle" so you can get this map file, too. Just wanted to chime in that this is a steal for the low price!